The Fox School of Business was founded in 1918 and accredited by the Association to Advance Collegiate Schools of Business International in 1973. The school began offering an MBA degree in 1942. Students at the Fox School of Business have several MBA options, including: the Global (full-time) MBA, part-time MBA, Executive MBA, Online MBA, and joint JD/MBA. The Temple University main campus is located on 105 acres within the city of Philadelphia, PA. In addition to Alter Hall, completed in 2009 and situated just east of Broad Street on Temple’s North Philadelphia campus, Temple also maintains classroom space in Center City, facing City Hall, and in Fort Washington, PA, for its part-time, evening and weekend students. Meanwhile, the Executive MBA program is conducted at The Hub Commerce Square at 20th and Market Streets in Center City Philadelphia. Temple University also has campuses located outside of the United States in, among other countries, France, Japan and Singapore. The Fox School of Business is located roughly 12 miles away from the Philadelphia International Airport. 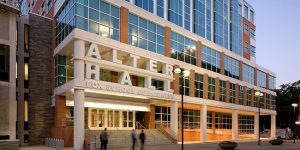 Alter Hall is home to the full-time MBA and undergraduate program at Fox as well as some of the part-time courses. This 217,000-square-foot facility comprises six case study rooms, a 4,200-square-foot common area, lockers and a business center specifically for the use of MBA students. Alter Hall also features office space for faculty and administration, four large lecture halls, conference rooms, nine research centers, breakout study rooms, more than 10 interview suites and a 274-seat auditorium. Temple University’s Center City location, known as TUCC, was opened in 1973. Temple maintains six floors at Penn Center, with Fox School of Business graduate programs operating out of the sixth floor. TUCC’s campus also boasts a café, library resource center, faculty offices and advising offices in addition to space for other graduate, undergraduate and continuing education programs. The Hub Commerce Square in Center City houses Temple’s EMBA program. Primarily a non-residential program, the EMBA classes meet one weekend a month on Friday, Saturday and Sunday, supplemented with two online sessions a month. Students who wish to stay overnight can do so at no additional cost. The Fort Washington campus, a 35-to 40-minute drive from Center City, features two buildings that encompass classrooms, computer labs, offices, and lounge areas. Fox has around 195 faculty members who teach courses across nine academic departments: accounting; finance; human resource management; legal studies in business; management information systems; marketing and supply chain management; risk, insurance, and healthcare management; statistics; strategic management; finance. In addition to holding advanced degrees, many professors at Fox have gained practical international business expertise through consulting, executive and entrepreneurial experiences. Fox typically enrolls about 100 students in its full-time MBA program with around 50 entering per year. About 55 students are in the yearly-in the part-time program, with around 125 EMBA students. Nearly 8,000 students in total are enrolled in the Fox School of Business. The Fox School of Business offers a two-year, full-time MBA degree (the Global MBA), in addition to the Executive MBA, Online MBA, and part-time MBA programs.